That bridge built with dark limestone is located on the railway line from Tiefencastel to Filisur in the Swiss canton of Grisons. The Landwasser viaduct is a 136 metres long and 65 metres high railway bridge of the Rhaetian Railway and considered to be an emblem of the company. 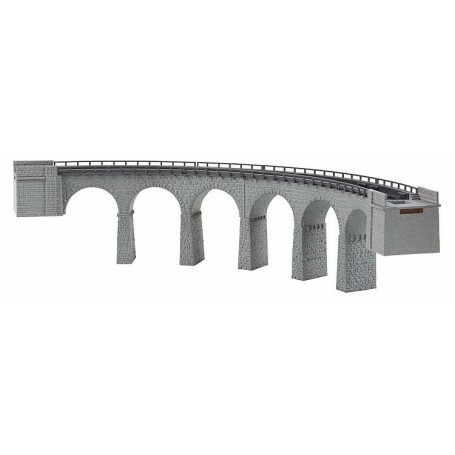 That curved viaduct is composed of 2 bridge elements with ballast, each one 45° long (can be shortened to 30°) featuring an average radius of 193 mm. Its clearance height with pillars is 57 mm (6 pillars of 38 mm). The bridge elements can also be used separately. The viaduct set can be operated with a single track and contains in addition 2 tunnel portals that perfectly complete the set.